Curtains are a staple for any room in your home or business. They provide a wide variety of services, including privacy, decor, and temperature control, and you can find many different styles, designs, and options to meet your needs from QuickFit Blinds & Curtains. We take care to offer you the best selection of top-of-the-line curtains online, and we’re here to offer you the information you need so that you can make the best decision for your home or business. When it comes to finding the curtains that offer privacy without sacrificing light or design, consider sheer curtains. The flowing feel adds to your home decor while still providing a distinct layer between your room and the outdoors. If you’re not picky about the amount of sunlight sneaking in the room, then consider blockout curtains. These block out all light, thus ensuring your complete privacy. Curtains come in a large variety of colours, fabrics, designs, and sizes. At QuickFit, we give you the option to shop our curtains by colour or style to narrow down your browsing time. If you can’t find your dream curtains in our collection of ready-made curtains, then order free fabric samples and explore your options with our custom-made curtains! Curtains do wonders for your energy use. During the summer, proper curtains can keep the heat out and keep your space cool. The opposite applies in the winter. As an added barrier between your room and the outdoors, air flow is blocked and energy is conserved. 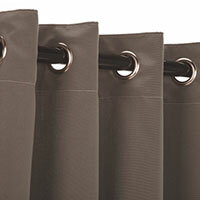 To add to the economic value of your home or business, consider purchasing blockout curtains. They work well to add an insulated layer to your windows, and they can block natural light whenever you want. Check out these pages for more helpful tips about curtains! Eyelet curtains are a very popular choice for today’s style. These are very simple to install as you simply place the curtain rod through the 40mm metal eyelet rings at the top of the curtain. 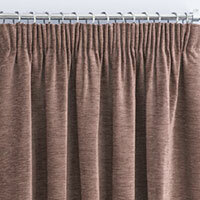 Concealed Tab Curtains are the perfect choice if you’d like to hide the curtain rod. The tabs create a hidden slot to install the curtain rod behind the fabric for an elegant look to your room. Pinch Pleat Curtains are the contemporary classic style of curtain header, offering lovely pleats to add an element of volume and pattern to your window covering. 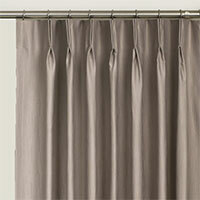 Pinch pleat curtains require curtain rings to install the curtain to the curtain rod. 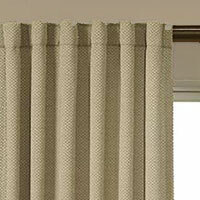 Pencil Pleat Curtains are very similar to pinch pleat curtains. The difference is simple: the pleats are much closer together - thin like a pencil. Similar to pinch pleat curtains, pencil pleat curtains require curtain rings for installation. Custom curtains can be created and delivered to your door within ten days of your purchase! If you don’t want to order custom curtains, we have ready-made curtains available. They are sorted by header category for your convenience. Ready-made curtains generally take three days for shipment and delivery. Happy shopping!